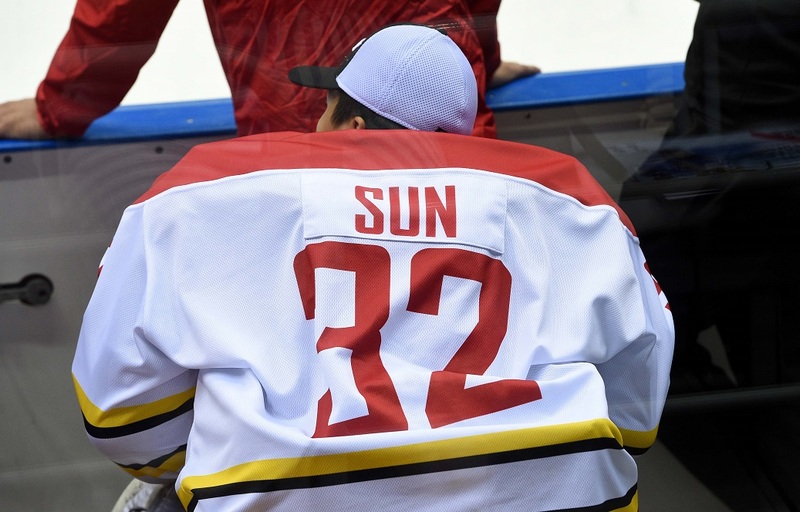 Kunlun Red Star goalie Sun Zehao has forced himself into consideration for his club’s KHL roster for the coming season. In an exclusive interview with KHL.ru, he spoke about Jussi Tapola’s unusual training methods, working with Russian hockey legend Alexei Kovalev, summer camp with the Vancouver Canucks and the development of Chinese hockey. The coming KHL season could bring us our first ever Chinese goalie. The People’s Republic is taking its hockey seriously and the 2022 Winter Olympic host wants to spring a few surprises in four years’ time. Everyone has already seen how when China puts its mind to something, it can achieve remarkable results and the creation of the Kunlun Red Star project lifted the country’s hockey program to a new level. 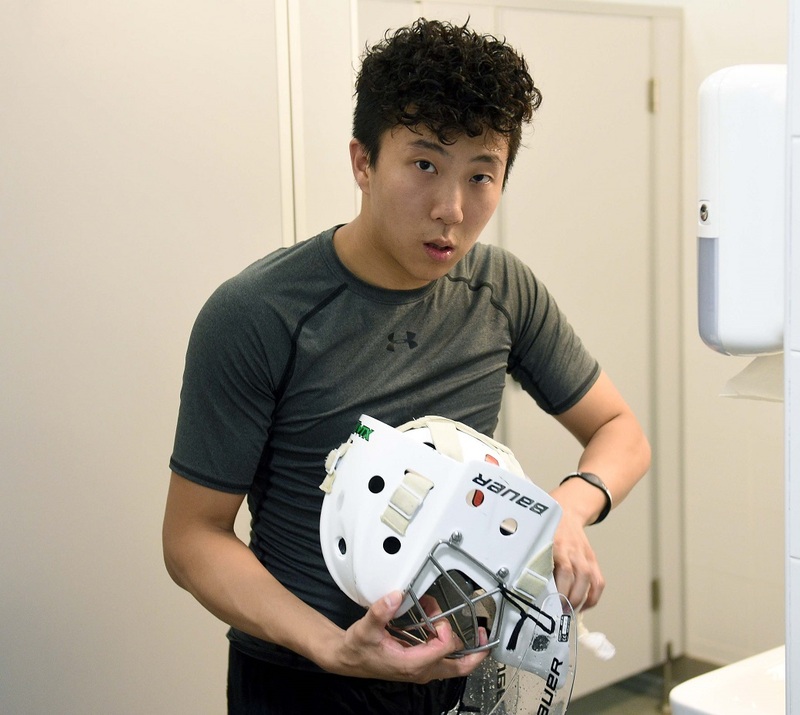 Now the big task is to bring on local talent – players like netminder Sun Zehao. He’s been gaining top-level experience in pre-season friendlies and was part of the roster that the KHL team took to Sochi for the recent Hockey Open. Special thanks go to another important figure in Chinese hockey, Zach Yuen, the first Chinese player to score a KHL goal. He acted as translator for this conversation. - You’re still waiting for your KHL debut. What is your main goal for the coming season? - You’re right. Now my goal for the season is to get my place on the team, play my first game in the league and improve my game overall. - What are your first impressions of head coach Jussi Tapola? - I think he’s a very good coach. His style is interesting. He doesn’t yell at the players, he is always ready to communicate and to help. He is more like a mentor than a boss. I don’t speak English, and I don’t understand it very well, but he still motivates me to get better every day. - Do you plan to learn English to understand Tapola better? - Of course I want to, but it’s very difficult. Right now we are working with an interpreter but many of my team-mates speak English and I’ve picked up things from them over the last couple of years. - In the summer, the famous Russian forward Alexei Kovalev joined Red Star’s backroom team. What do you think of him as a coach? - He likes to spend time with the players, he talks to us a lot. Kovalev often talks one-on-one with the guys and this really helps the Chinese players to develop. - Did you know just how famous he was before he came here? - Of course. Kovalev is a special player, not just for Russian hockey but all over the world. He’s a legend. It’s great to be able to see him every day, to talk with him. - At your training camp in Latvia, Jussi Tapola had you playing war games, paddling kayaks and doing parachute jumps. Was that the most unusual training regime of your career? - It really was! It was such a difference from what I’d done before. In our team, we speak different languages but on these tasks we all had to cooperate and work as one. I think it gave us a lot more than just practice and exhibition games. - Two years ago there were almost no Chinese players at Red Star, but a few weeks ago you played against Pirati Chomutov with an almost entirely Chinese roster. - It was a good chance to check on the progress of our Chinese players. We held our own against one of the leading clubs in a strong European league. Before the Olympics come to Beijing in 2022 we can be even stronger. - Were you inspired by South Korea at the Olympics this year in PyeongChang? - Yes, we can learn a lot from them. But I think that team China, thanks to the huge support for sports in our country, can perform well at our home Olympics. - Right now, Team China plays in Division IIA of the World Championship. When are you targeting another promotion? - I think we can go for promotion this season. Last season, for the first time in nine years, we managed to stay at this level. Some of the teams there skate better than us but we are not going to give up. We want to get better. That’s the thing about representing your country: it’s a huge motivation. - Last fall you went to the Vancouver Canucks for a training camp for Chinese players. What was it like to work with legends like the Sedin brothers? - Of course I was delighted to get this opportunity. It was a really useful experience for me to see these guys and understand how they practice. - What does China need to do to speed up the growth of its hockey program? - We need more opportunities for our players. We don’t have a professional league in China so many young players have to stop playing because they cannot earn a living at the game. They change professions, or maybe they leave to play in North America. It’s very difficult to start a career in hockey in China. We need more professional teams, so more Chinese players get a chance to show what they can do. That’s why it’s so cool that Kunlun Red Star and the KHL have come to China. I’m sure this will start a new stage in our hockey development. Born Dec. 13, 1995 in Harbin, China.